Fly-half Rhys Priestland says Wales were "happy" to learn giant Fiji wing Nemani Nadolo is out of their World Cup clash on Thursday after being suspended for a tip tackle against Australia. Nadolo denied the offence and can appeal against the decision. But as news of 6ft 4in, 20st Nadolo's ban reached the Wales camp, Priestland said: "There's a few happy boys down in the team room." 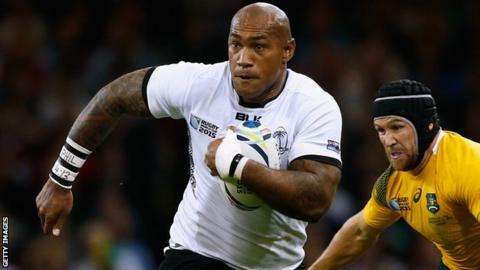 Nadolo has scored 16 of Fiji's 24 points in the competition. Three Fijians have been sin-binned during the tournament. In addition flanker Dominiko Waqaniburotu missed the defeat by the Wallabies after a spear tackle against England. The 27-year-old Nadolo scored a try as Fiji lost 17-13 to Wales in November, 2014. A World Cup statement on Nadolo read: "The judicial officer [Christopher Quinlan QC] deemed the act of foul play merited a low-end entry point of two weeks. "He did not consider there to be any aggravating factors. However, taking into account mitigating factors including his excellent disciplinary record, the judicial officer reduced the suspension to a period of one week." Nadolo's suspension lasts until 5 October, the day before they face Pool A rivals Uruguay at Milton Keynes.